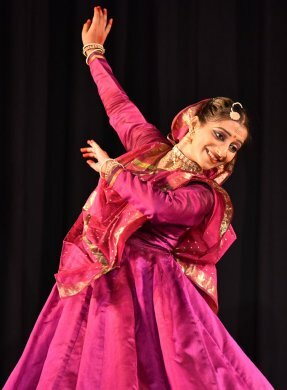 Geeta Chandran and her institution Natya Vriksha celebrated World Dance Day on 28th and 29th April in collaboration with India International Center in their main auditorium in New Delhi. This was the 13th edition of their curating Young Dancers Festival, Dance Workshops, illustrated lectures and honouring persons with Lifetime Achievement Award. On both the days there was a record full house audience presence. In the morning at IIC's Multipurpose hall on ground floor at Kamaladevi block, we saw active participation by more than 60 young dancers from 10am till 1pm, taking workshops from Delhi based theatre director Anuradha Kapur and Odissi exponent Sharmila Biswas from Kolkata. Over the years the celebrations of World Dance Day are conducted with great enthusiasts all over the world. It first started in France. World Dance Day is celebrated worldwide on 29th April, the birthday of Jean-Georges Noverre (1727-1810), creator of modern ballet. It was initiated in 1982, aimed at attracting attention to the art of dance, to promote and to make people aware of the value of dance in all its forms across the world, to enable the dance community to promote their work on a broader scale, so that governments and opinion leaders are aware of the value and importance of dance in all its forms and support it and to share the joy of dance with others. It was established and promoted by the Council of International Dance, and the Dance Committee of International Theatre Institute (ITI). Both of these institutions are official partners of UNESCO. The enthusiasm which is seen all over India in celebrating World Dance Day is contagious. I have attended several such events in other cities like Bangalore and Mumbai, some on a grand scale and some by individual dancers under the aegis of their dance schools. Institutions like National Centre for Performing Arts (NCPA) in Mumbai plan such events inviting choreographers to curate the event and making it inclusive. It fosters goodwill among dancers of different dance forms and thereby reaches out to larger communities interested in dance. Dance aficionados look forward to these celebrations. In Delhi, Sangeet Natak Akademi organized at Meghdoot theatre, performance by Kathak maestro Pandit Birju Maharaj, followed by his disciples. Odissi exponent Ranjana Gauhar presented performances of her disciples and honoured few artists at ICCR Auditorium. There were other celebrations also. On Saturday morning when I arrived at Multipurpose Hall, there was complete silence and dancers were walking up and down as exercises in the hall. 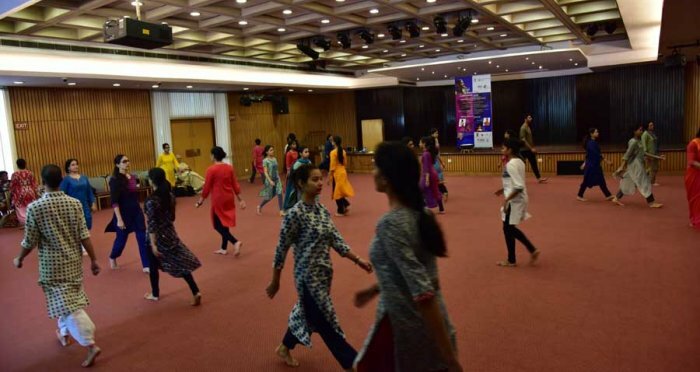 Former director of National School of Drama (NSD), Anuradha Kapur was giving instructions to participants about how to breathe; they were made to lie down on floor, roll, move, not talk, were subjected to several exercises which were new for dancers. One of the most interesting one was of tying with a thread either wrists or thumbs of two dancers, selecting their partners and asking them to close their eyes and move out of the hall, climb down the steps, walk across on the ground and come back to hall. The experience was quite startling. The participants were asked to relate their reactions and it was interesting to know how they moved, trusting their partner and what awareness they felt about body. One more exercise was of after selecting partners, one falls on the other, who holds him/her back with palms - the trust that he or she will not be let down or fall. Also when lying on floor they were asked, with closed eyes to move pushing themselves up towards the centre and form a circle. There were also instructions to think not about themselves but say a family member. Watching these exercises I realized that in dance, dancers do not touch each other. There are inhibitions. How to overcome these inhibitions is an important lesson. The preparation of body, the breathing exercises are important. In Koodiyattam, dance theatre form of Kerala, there are special exercises for breathing which actors/dancers learn. The dancers in order to follow or repeat these exercises were given video recordings by YouTube with a password so that though in public domain they were accessible for only dancers who participated. It was interesting to have a theatre director working with dancers and dancers exploring areas where body is concerned form point of view of theatre. The Sunday morning work shop by Shamila Biswas was entirely different from that of one conducted by Anuradha Kapur. This was by a dancer who had over the years worked out methodologies of warming up and cooling down exercises. 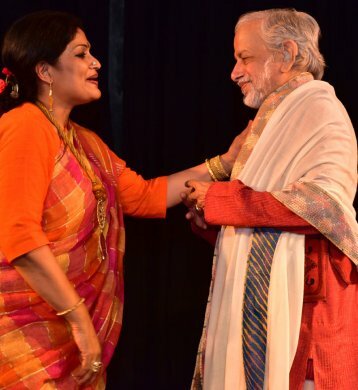 Sharmila spoke of how Guru Kelucharan Mohapatra while teaching them many years ago at Cuttack, worked upon bhramaris, pirouettes,charis, akash charis and being a creative artist, how he could evolve several ways of moving in circles. Sharmila made all dancers learn warming up exercises so that the muscles are warmed up, loosened and dancers can have more flexibility. All dance forms must be having these exercises and each guru must have thought of how to have warm up exercises done so that body is ready for different movements. Standing, bending, keeping knees together, bring nose close to the knees, how to keep back straight, leg straight, while sitting how to bend and hold toe, repeat alternatively. These could be used by not only Odissi dancers but majority of dancers of any school. Sharmila and her disciple Monami Nandy demonstrated. From stage, she asked dancers on floor to imitate movements. I had seen at Nrityagram how Surupa Sen and Bijayani have worked out their warm up movements and also Yoga exercises. Sharmila also showed various asanas. She was to offer workshops on bhramaris, moving in circle. How the weight was to be distributed on thighs, how balance was to be maintained, how body had to turn, keeping spine straight, turning body, where eyes to follow, where two arms to be held in a diagonal and so on. Explaining how bhramaris in Bharatanatyam can be performed investing them with newness, and how jumps can be employed etc was interesting to watch. From 10am till 1pm with brief intervals, these exercises prepare a dancer to train her body. There were exercises for cooling down which were also quite fascinating. When I studied Kathak and Bharatanatyam, none of my teachers ever taught us any of these warm up exercises. Today the dancers have become more aware of physical injuries, wrong body positions which could result in injuries and how to avoid them. This awareness is extremely important and as Sharmila put it also helps to use imagination for making dance beget more beauty. Geeta Chandran, Rajiv Chandran and Natya Vriksha dancers as well dancers from other dance styles displayed great enthusiasm in learning these exercises which helped them to learn subtleties of other dance forms. 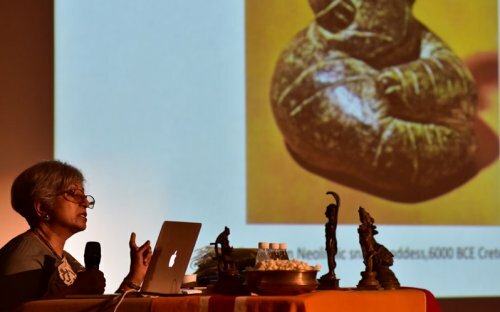 Dr. Shreedevi Nair Pal gave an illustrated talk on serpent worship and its influence on Indian Iconography and Art. The display of paintings and sculptures were created by Rasaja Foundation. The well known art historian took us across several centuries and to the origin of snake worship in evidence from Neolithic gods and goddesses, the serpent iconography, several illustrations in paintings and sculptures from Egypt, Mesopotamia, Greece and ancient civilizations, how in India across several religions, serpent has held fascinating hold, its representation in monuments, cobras, reference to Harappan civilization, mention in Rig Veda, how when churning ocean halahala poison had emerged and Shiva drank it holding it up to his neck and hence is called Nilakantha, serpent as symbol of fertility and its various concepts - the speaker reeled off with her erudition. Her range of research was not only wide but also supportive with fascinating visuals from various sources. At times one felt that when with power point presentation she was showing various chapters, she could have limited her observations orally. 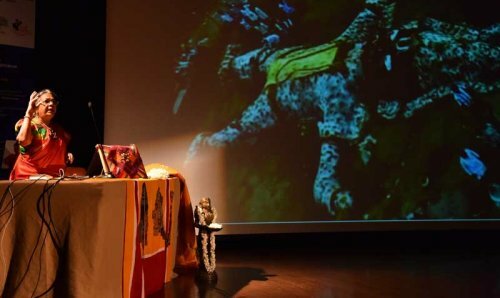 That her study was thorough was evident and it was most important that dancers get an exposure to these images and learn a lot about various civilizations and if they feel like using the imageries of serpent in dance there was a lot they could draw upon for sanchari bhavas, improvisations. We were told that her thesis is also to be published in a book form with several illustrations. The next day, Chennai based V.R. Devika gave two illuminating talks with video projection and slides on Traditional Performing Arts in Education and Dr Muthulakshmi Reddy and her case of Devadasis. Devika started as a school teacher when she was 18 years old. Her total dedication and research, innovative teaching methodologies, study of Bharatanatyam under Dhananjayans, as a critic, writer on cultural issues for past thirty and more years, work on Gandhiji, Aseema Trust, interest and commendable work in folk dances of Tamil Nadu, multitalented and as a scholar with innumerable awards and honours ,V.R. Devika is a part of cultural scene of Chennai. We had an occasion to attend her talks at Vadodara during Dr. Parul Shah's two day dance festival in memory of Anjali Merh. Therefore attending her presentation was a bonus as some of us learnt a lot on Dr. Muthulakshmi Reddy and her involvement for upliftment of Devadasi community, its detailed history and Devika's perspective. The video screenings of how folk dances are introduced in school and children are made part of the performances were very interesting. The huge statue of Duryodhana in a village, the rituals involved with it, and performances of songs and dance were mind boggling. The Therukoothu performance, Draupadi's worship and folk dances of Devaranama were explained by Devika in a lucid manner. But the most educative part was her lecture on Dr. Muthulakshmi Reddy and case of Devadasis. Those of us who have done our Ph.D and have studied history of Bharatanatyam have some information about how Dr. Muthulakshmi Reddy, a woman from Devadasi community fought for the rights of Devadasis and had brought legislation for prevention of performances of dance in temples which became a law in 1947. There were several misconceptions that Muthulakshmi Reddy wanted dance to be banned. She was against the immorality attached to dance and since the rights of Devadasis were not protected, she fought for them. The men who married Devadasis were dependent upon them but not for children after their marriage with Devadasis. Devadasis had to bear the burden. Of course among Devadasis some were very well known and also well off, but what Muthulakshmi Reddy did for their upliftment has not been much understood. The statistical figures Devika showed on her research when she interviewed workers in Avvai Home set up by Muthulakshmi for orphan children of Devadasis, show how she had opposed marriages of young Devdasi children from age of 5, married to old men and when they died, they soon became widows as they were married to older men. Their number increased from year to year. Muthulakshmi fought against such marriages. She fought for their rights to study in schools. She herself went to London and obtained a degree in medicine and was a doctor who removed the system of wet nurses. She established Avvai Home for orphan children of Devadasis, at the same time in 1936 Rukmini Devi established Kalakshetra just opposite the Avvai Home. The controversy between E .Krishna Iyer who promoted Sadir dance of Devadasis and opposition of the same by Muthulakshmi have to be understood in right context. Muthulakshmi was fighting against immoral practices and not against dance. She fought for franchise, voting right for women, she was the first woman to be nominated for Legislative Assembly and had trained herself to argue with those in power in court who opposed her. Devika threw light upon Muthulakshmi Reddy's various revolutionary steps and how she succeeded in achieving some goals. There have been few studies on her life and work in North America. Also in recent times in post colonial studies other books have been written. For dancers, this sociological study of Muthulakshmi is very important. Congratulations to Geeta and Rajiv for inviting Devika to Delhi and arranging this most illuminating lecture which dispelled many wrong notions about Muthulakshmi's work. Since last year Natya Vriksha has started giving Lifetime Achievement Award to a distinguished person who has served the cause of dance. Before she passed away Shanta Serbjeet Singh, the renowned dance critic and Vice Chairman of Sangeet Natak Akademi, was honoured with Natya Vriksha Award. Her services to the dance word are well known. Her writings are now digitalized by Indira Gandhi National Centre for the Arts (IGNCA) and provide a remarkable history of Indian dance and dance criticism. This year the celebrated photographer, Sangeet Natak Akademi awardee for dance photography Avinash Pasricha, was honoured with Natya Vriksh Award for his invaluable services to the world of dance in terms of photographs of every major dancer since 1950. He has become a legend in his lifetime for dance photography. I am privileged to have him as my co-author for my several books on dance as we travelled together for research and he documented the dance forms, gurus and exponents. His wife Santosh stood by him throughout his active career. She too was honoured on this occasion. In the evening, two young dancers were scheduled to perform. Odissi dancer Monami Nandy, disciple of Sharmila Biswas, was to have her debut as a solo dancer. She has been performing with Sharmila for past many years as a member of her troupe. With sound training in martial arts, theatre and classical Odissi she was being launched as solo dancer. Sharmila Biswas is known for her explorations in various dance traditions of Odisha, mridang instruments in other parts of Odisha, using them imaginatively bringing different sound textures. In Abahoni, meaning invitation to Rangapuja, in praise of Lord Ganapati using sabadaswarapata recitations, describing the iconic figure of the lord, Monami danced with great abandon, energy and displayed various ways of offering pranams to the lord to vibrant ukutas - mnemonic syllables - creating devotional mood. The tandava element was all pervading. She danced with free spirit as if the stage belonged to her. It was refreshing to see her performing Odissi with such freedom, grace and captivating mood. In next composition to the music by Ramhari Das, rhythm by Dhaneswar Swain, the dance of Shiva and Parvati, the confluence of Purush and Prakriti, male and female, in which the graceful lasya aspect of dance of Parvati was delineated delicately, the ardhanariswara form , with tandava dance for Shiva, Monami used expansive movements, Shiva's ornaments in quick recitation Phani bhushanam, ornaments of serpents, with crescent moon on his jata, Chandrachuda, Vyaghrambara, garment of tiger, brought Shiva's image before one's eyes. The phrases in quick succession for Parvati Jagatjanani, mother of Universe, Singhavahini, astride lion, sindhur on her hair, Ambika dancing with sung ukutas inda thai ta thai, and alternating with sound of drum Damaru dimi dimi, Shiva in his naked form Digambara, dancing with trident, Trishuldhara, and the resounding wild sound Nadabhayankar, and taking suchi hasta, Monami with finger pointing to her hand and dancing to inda thai ta thai, followed by sabdaswarapata sounds of bells Ghantaninada, and in celestial form of Mohini casting a spell, she concluded the dance with great flourish. The musicians on mridanga Vijaykumar Barik, on violin surmani Ramesh , vocal by Rajesh Lenka and on manjira Sharmila Biswas complemented and embellished Monami's dance. The next presentation was by Bharatanatyam dancer Shweta Prachande from Chennai, a disciple of Priyadrasini Govind. She has also studied under Sucheta Chapekar at Pune, has exposure of contemporary dance at Laban, UK, and also mastered martial art. She has assimilated all these disciplines dovetailing them to Bharatanatyam in a delectable manner. Performing Kavuthvam in praise of Shanmukha penned by ghatam maestro Dr. S. Karthik and composed by him as a part of Purnakumbham audio Cds in Shanmukhapriya raga and adi tala, Shweta with her quicksilver movements danced with precision and elan. The utplavanas were eye catching and circular movements on knees on floor, suggesting holding Kavadi, telling Om pranava mantra to Shiva, Shanmukha's vehicle peacock, its graceful movements, all were packed in artistically. The piece de resistance indeed was Swati Tirunal's varnam in Kapi raga Sumasayaka that saw Shweta in her element. The pangs of separation from the beloved, flashback of being with her lord, the lajja, shyness, looking at moon and rebuking him, the nayika's plight, counting on fingers the time that has elapsed, the intense pain, Ramanimani tave shayane, the time that separates nayika from beloved, praying to Lord Padmanabha were essayed with clarity and intensity. The nritta passages alternating abhinaya were danced with complete command, and perfect teermanams. The Bharatanatyam form seemed to flower with succeeding phrases leading to uplifting feelings and aesthetic experience. Chooda re in Sahana raga gave Shweta ample scope to enact abhinaya of a carefree woman who could not care less for what others say for her love for Shri Krishna, her walking, ignoring the gossips and jealousy of neighbours, the women who revel in making snide remarks. She vividly mimicked them and showed off her supremacy. Shweta performing tillana in Purvi in druta evoked joyous mood with movements which were eloquent. Tottuswaram had all the melody and ending with prayer in praise of Minakshi using several silence phrases, she concluded the performance winning appreciation of large crowd. Shweta is petite but once on stage she performs with tremendous confidence, obviously a result of her relentless sadhana. Nattuvangam by Jayashree Ramanathan, vocal by Binu Venugopal, mridangam by Sivaprasad and violin by Nandini Sai Giridhar, the celebrated accompanists from Chennai gave her excellent support. From young generation Shweta has made a name for her flawless dancing. Next evening from Trissur, Kuchipudi dancer Sreelakshmy Govardhanan stole the show. 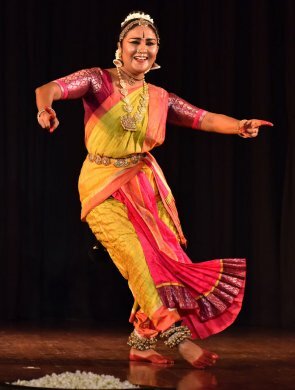 She has a commanding stage presence and having studied under the great guru Rattaiyya Sharma from Kuchipudi village, she has mastered the typical bobbing up movements of Kuchipudi. The lilt and grace were evident in her nritta. The Ramayana sabdam in Kuchipudi in Mohanam raga, narrates the story of Ramayana with key incidents, praising Rama as Raghavadasharathatmajam, Sitapati, Raghukula ratna dipam. Beginning with putrakameshthi yagnam, Dasharatha begetting four sons, and in quick succession leads to Rama's going to forest, golden deer and Sita's wanting it, Sita's kidnapping by Ravana, Jatayu's valiant fight, incident of Vali Sugriva, Vali's death by Rama's shooting him from behind a tree, the setubandha, and Rama and Ravana's fight, Rama shooting arrow at the spot where Ravana had nectar, Rama's return to Ayodhya, all these incidents were interspersed with nritta, ardhashikhar hasta and quick movements, keeping the flow intact. 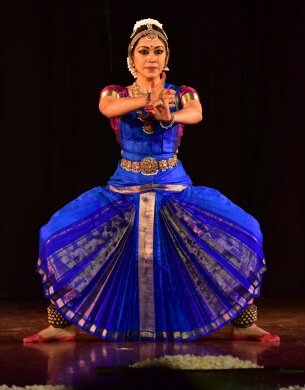 Sreelakshmy chose to present her own choreography of Krishnastuti before performing Tarangam, dancing on rim of brass plate. She included Navarasa, delineating upon how devotees and other characters look at Krishna, an interesting approach. She depicted shringara in company of Krishna. The dramatic treatment was seen in showing karunyam, when Draupadi was humiliated in court and Krishna protected her. Veera rasa was depicted for Kurukshetra war Krishna giving Gitapodesham to Arjuna and making him fight. She wove story of curse of Gandhari on Krishna for raudra rasa. The interesting episode was for bibhatsa rasa. When Krishna enters the mouth of alligator, Yashoda gets upset and pulls Krishna back as she finds the alligator's mouth and smell repulsive. Indra is wonderstruck seeing Krishna lifting mount Govardhana. Shanta rasa was shown for Bhishma's passing away at Arjuna's arrow, hasya was shown when Krishna stole clothes of Gopis when they went for bathing. In bhayam Kamsa gets shocked and frightened as Krishna kills elephant before coming to fight with him. Sreelakshmy interpreted Moksha presenting episode of Puthana visiting Gokul to kill Krishna - The gopis churning butter, mixing with them in guise of a beautiful maiden, stealthily taking Krishna to breastfeed him and finally meeting death. But whosever dies at hands of Krishna attains moksha, nirvana. Sreelakshmy performed the episode dramatically. Though Puthana Moksham is a popular episode for a solo dancer in Kathakali, before dying Puthana sees form of Lord Vishnu with conch, lotus, disc and mace and achieves moksha. This was an excellent touch. Sreelakshmy managed to perform it in Kuchipudi within Kuchipudi idiom. Tarangam as usual with chanting praise of Krishna, and balancing herself on brass plate executing various complex rhythms, a favourite number won her rounds of applause. The srutilaya melam, confluence of sound and rhythm was enjoyable. Shreelakshmy's performance was of a commendable standard. How I wish I could have said the same for the final Kathak dancer Vidyagauri, a disciple of Rajendra Gangani. That she is a talented dancer there is no doubt about it. But the speed with which she performed throughout was disconcerting and disturbing. The trend in contemporary Kathak is on such speed that one wonders in which direction Kathak is moving. Vidyagauri chose to perform in teentaal and all pure dance numbers whether paran amad, or tihais, uthans, thaat, sangeet ka tukda or display of jaatis tishra chatushra and so on, received the same treatment. The twenty five chakkars with which she began had set the tone.The Jaipur gharana has its own vigour and forceful style. However, I could not enjoy such a presentation. Vidyagauri and her guru will have to give a thought to this aspect seriously. If Kathak goes this way only it will lose its position as a classical dance form on par with other dance forms like Bharatanatyam and Odissi. Even Ek shloki Ramayana of Tulsidas was performed with speed and did not leave any pleasant impression. Yogesh Gangani on tabla, Samiulla Khan on vocal, Raghavendra on violin, on sitar Shyam Rastogi, and for padhant recitation Muzzafar Mulla did what they are best to do as accompanists. But nothing saved the presentation as there was no respite. No wonder in South, Kathak dancers do not find enough shows. The two day festival was wonderful in all its curating with artistic endeavor, including lighting by Milind Srivastav. Both Geeta and Rajiv Chandran and their Natya Vriksha team leave no stone unturned to make the event memorable. Selection for Kathak requires serious thinking. The form is facing a crisis in absence of a sound direction. And it needs serious thinking on part of performers, gurus and organizers. But apart from that one performance, what Natya Vriksha offered was sumptuous and memorable. Congratulations to all who worked towards making World Dance Day event memorable.